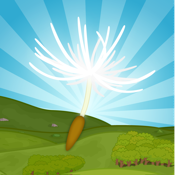 Play as the final seed of a Dandelion flower. Your goal is to travel as great a distance as possible across the lands, and to spread your family far and wide. A place where "Game Over" does not signify death, but simply the start of a new life (if not, perhaps, a new high-score). * Video replays available on devices newer than iPhone4, iPod4, and iPad1.